The state of Florida is an intermittent flashpoint of shell mound research. This process was initiated in the 19th century by Jeffries Wyman, whose 1875 publication Fresh-Water Shell Mounds of the St. John's River, Florida highlighted methods that are now commonplace. Wyman’s innovations are often attributed to familiarity with the Scandinavian shell midden school. I examine how Wyman’s experiences engaging with the archaeology of northeast Florida also structured his methods and interpretations. I employ GIS to reconstruct Wyman’s reconnaissance surveys based on his daily field journals. I consider the characteristics of his encampments and changing field methods. By visualizing Wyman’s excursions, I consider why he emphasized certain sites and observations over others, and reconstruct how he conducted his excavations. The results have significance for local researchers who use Wyman’s research, and anyone interested in the influence of field experiences on the emergence of prehistory as scientific inquiry and its theoretical consequences. During the 19th century, shell site investigations on the Atlantic seaboard were a critical nexus of persons, ideas, and methodological innovations that led, eventually, to a scientific American archaeology (Bourque 2002; Kirakosian, this issue; Trigger 1986). Of particular importance in this process was Jeffries Wyman, first curator of Harvard’s Peabody Museum of American Archaeology and Ethnology, and his investigation of shell sites on the St. Johns River in northeast Florida. 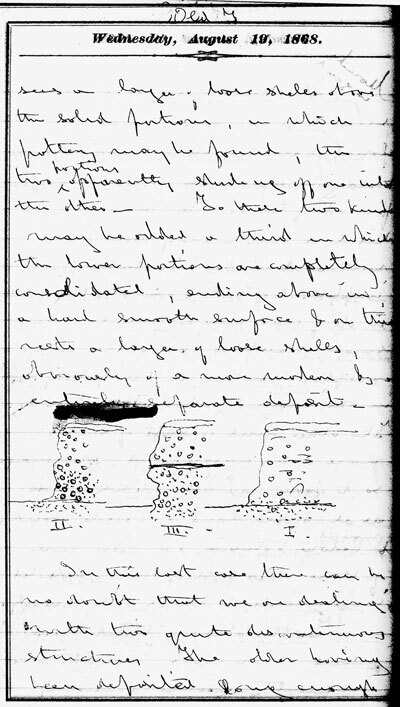 Wyman’s posthumously published monograph, The Fresh-Water Shell Mounds of the St. John’s River, Florida, relates his observations of the structure and content of at least 48 shell-bearing sites and sand mounds, and provides interpretations of how they formed (Wyman 1875). Importantly, his report included a number of techniques that would become commonplace in Americanist archaeology later, in some cases not for another 50 years: stratigraphic recording and interpretation; taphonomy; paleoecology and hydrology; pottery typology; zooarchaeology; bioarchaeology; comparative ethnographic analogy; recognition of different ancient cultures; and a relative chronology based on stratigraphy and material culture (Browman 2002a; Stoltman 2004). Equally striking are the regional scope, large sample size, and high level of detail provided for many locations in the monograph. Wyman’s research influenced a number of central figures in archaeology including Edward Morse, Frederick Ward Putnam, and Clarence Bloomfield (C.B.) Moore. Wyman was also a vector, by way of European scholarship, for prehistory as a science of human development based on ethnology and geological principles (Bourque 2002). Wyman’s descriptions of shell sites continue to be an important resource for Florida archaeologists as well (e.g., Eck 2000; Randall 2014; Wheeler, et al. 2000). The majority of the places he visited have been significantly altered or destroyed in the last century. In this paper I address one of the vexing issues regarding Wyman’s published work: how did he do it? Virtually every modern historian of early Americanist field methods (in particular stratigraphic studies) has stated that Wyman’s influence on the development of archaeological field techniques is almost impossible to determine. His methods were never elaborated in the monograph or related papers. Fortunately, Wyman kept a daily journal during his travels on the St. Johns in 1867 and 1871–1873. The journals contain a wealth of unpublished data, including the frequency and duration of site visits, 22 stratigraphic drawings, and five site plans. His entries also reveal his changing interests, conclusions, and methods. I am in the process of transcribing all of the journals, and have analyzed his Florida artifact collections curated at the Harvard Peabody Museum. In this contribution I emphasize Wyman’s field experiences and methods. First, I place Wyman’s contributions in historical context, and outline why his work is significant today. Second, I reconstruct Wyman’s expeditions via a GIS geodatabase (Table 1). The north-flowing St. Johns River is the largest river in Florida (ca. 500 km in length), and has freshwater (upper and middle basins) and saltwater (lower basin) portions. Wyman targeted a 165-km-long segment of the freshwater basins (Fig. 1). I describe how he conducted his regional survey, and reveal how his interests in shell sites changed through time. I conclude by summarizing Wyman’s strategies. Based on these data, I argue that it was Wyman’s unique personal and professional history, coupled with his experiences engaging with shell sites and the ancient cultural geography of Florida, that resulted in his many innovations. Freshwater shell matrix sites visited by Jeffries Wyman (sorted from north to south), with tabulations of the year of visit, frequency of daily visits per year, and known plan maps and stratigraphic drawings. The map ID corresponds with site locations in Figure 1.
a Plan map produced at this site during this year. b Stratigraphic profile produced at this site during this year. c Site known to have been visited by Wyman, but specific dates unknown at this time. 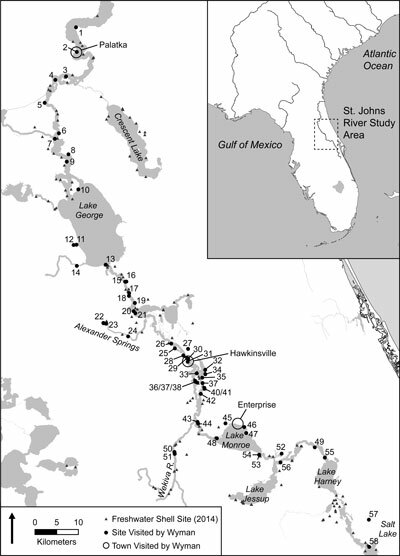 Wyman’s excursions in a regional context: distribution of all known shell-bearing sites on the St. Johns River in northeast Florida as of the year 2014, archaeological sites visited by Jeffries Wyman in 1867 and 1871–1873, and select place names. Note: numbers on Wyman’s sites correspond to site names and information in Table 1. The bulk of the field research in Florida that informed Wyman’s monograph was conducted between 1867 and 1874, during his tenure as the Peabody Museum’s curator (Wyman 1875: 15). The fieldwork may have not happened were it not for a chance meeting with G.A. Peabody—a distant relative of the Peabody Museum’s benefactor—on the streets of Cambridge. For his journal on December 15, 1866, Wyman wrote ‘Met G A Peabody in the street who invited me to join with him in an excursion to Florida.’1 Wyman’s future excursions were animated in part by a desire to acquire objects for the new museum, which had just been established (Wyman 1868). In this endeavor he was successful. Wyman amassed more than 2,200 bone, stone, and ceramic objects. What separated Wyman from antiquarians, however, were his research questions. Are shell sites geological or anthropogenic in origin? If anthropogenic, what factors account for their creation and final disposition? Foremost among his insights was that Wyman correctly concluded that the mounds were the product of human agency—based on their stratification and objects—and showed evidence for changing cultural traditions (preceramic to ceramic producing) through time (Wyman 1875: 86). Wyman did not operate in a vacuum, and the 1867 excursion was not his first to Florida. Wyman’s accomplishments and influences have been chronicled elsewhere (Bourque 2002; Murowchick 1990; Packard 1878), but a few are worth mentioning here. In his positions at Harvard, first as Hersey Professor of Anatomy and later curator, he regularly interacted with natural scientists such as Louis Agassiz and Asa Gray, and corresponded with Charles Darwin. Archaeology was secondary to his interests in comparative anatomy until the 1860s. However, Murowchick (1990) suggests that by at least 1846 Wyman was interested in archaeology. That year he met Ephraim George Squier and established a professional relationship that would continue into the 1860s. Wyman was also exposed to antiquarian interests through his membership in the Boston Society of Natural History, as revealed in its publish proceedings. Theoretical and methodological inspiration came from geologists. Wyman likely learned stratigraphic principles and uniformitarianism directly from Lyell, with whom he spent time examining fossil sites in Virginia and Nova Scotia (Murowchick 1990). Bourque (2002) has demonstrated how Wyman and other early shell mound scholars were deeply influenced by the Swiss scientist Morlot. In an 1861 paper and 1863 lecture, Morlot described investigations of Danish shell-bearing kjökkenmödding (kitchen refuse mounds) and Swiss lake dwellings. More importantly, Morlot introduced ‘pre-historical history’ as a science that emphasized geochronology, context, association, ethnology, and progressive social evolution to the American scientific community (e.g., Morlot 1861: 284–286). Advances in understanding antiquity, coupled with historic accident, likely led to Wyman’s interest in shell sites. Due to tuberculosis, Wyman was obliged to travel south during the winter and to Maine during the late summer. In the mid-19th century, the St. Johns River was already being promoted for its beautiful vistas and the restorative properties of its many springs (e.g., Brinton 1869). Wyman travelled to Florida as early as 1852 (Packard 1878), but his first St. Johns River excavations took place in 1860 (Wyman 1875: 3). Wyman excavated shell sites in Maine and Massachusetts as early as 1867 (Wyman 1868), and made mention of them as early as 1864 (Packard 1878). It may have been in these northern contexts that Wyman passed on his ideas and techniques to Morse and Putnam (Browman 2002b). However, a case can be made that it was Putnam and Morse who introduced Wyman to shell sites (Christensen 1985), or that Maine and Massachusetts shell sites provided a place for collaborative experimentation (Kirakosian, this issue). Whatever the case, Wyman made similar notice of stratification in the shell mounds of Florida and the Atlantic northeast. Whether Wyman excavated stratigraphically or simply recognized stratigraphy post facto cannot be discerned from his publications or letters (Lyman and O’Brien 1999). Browman (2002a) has suggested that Putnam—who is now credited with formalizing what would become the ‘Chicago Method’—may have learned his techniques from Wyman. The published record is silent on this matter. My own interest in Wyman is derived from long-term research into the culture-history and significance of shell mounds in northeast Florida (Randall 2013). Wyman encountered a river densely packed with shell-bearing sites. They ranged in size from small scatters (what he called shell fields) to massive complexes (shell mounds), 10 m or more high and up to 400 m long. The mounds were composed predominantly of gastropods with occasional bivalves. Sand and shell burial mounds were also found in association with shell sites. Wyman recognized that the mounds were of great antiquity. The width of live oak (Quercus virginiana) trees suggested that the mounds had been abandoned hundreds of years prior, while changes in the hydrology of the river indicated that some mounds were constructed when the environment was different. He noted that there was an important distinction between components with and without pottery. What Wyman documented was one of the longest-lived shellfishing traditions in North America. His observations and pottery typology were soon verified and expanded upon by C.B. Moore (Moore 1892), and later formalized into a regional culture-historical sequence by John Goggin (e.g., Goggin 1952). In today’s terminology, the earliest shell sites date as early as 7,400 years ago, and are associated with the preceramic Archaic Mount Taylor culture (7400–4600 cal BP). Burial mounds were also constructed by Mount Taylor communities. Some shell sites were repeatedly inhabited during the subsequent Late Archaic Orange period (4600–3500 cal BP), when fiber-tempered pottery was innovated, and then by communities of the later St. Johns Period, who produced sponge-spicule tempered pottery and built that majority of sand mounds (3500–500 cal BP). Most of the sites Wyman observed were reduced or destroyed in the twentieth century. Because Wyman describes many sites with explicit measurements, it is possible to reconstruct them (Randall 2014). At the same time, Wyman’s belief that shell sites were places of refuse disposal only (following the kjökkenmödding model) continues to frustrate interpretations of Archaic shell sites as intentional constructions. This despite widespread evidence for mortuary ritual in these places, including some documented by Wyman (Randall 2011). Wyman published many accounts in The American Naturalist, as well as in his annual curator reports. Portions of each publication became incorporated into his final monograph. None of these sources contains a clear description of his methods. In order to remedy this confusion, I reconstructed Wyman’s travels on the St. Johns for the years 1867, and 1871–1873. In 1869 he traveled around the coast of Florida. There are no journals from his 1860 and 1874 trips. His journals, along with many letters, were transferred from a barrel in the Wyman family’s attic in 1969 and placed on loan at Harvard University’s Francis A. Countway Library of Medicine (Gifford 1978). There are 16 volumes. Three relate to the Florida excursions. Four are records of his travels to Surinam and the Rio de la Plata and Pampas of Argentina in the 1850s. A few are sketchbooks from his travels in the United States and Europe, and two are his daily journals for 1864–1866. The remainder were written by his wife, Annie, who died shortly after childbirth in 1864. Wyman’s journal of choice was Clayton’s Octavo, a leather-bound diary book produced annually. These are comparable in size to a hard-bound ‘write in the rain’ field book commonly used today. The octavo was also Annie’s favorite, and it appears that Wyman took up writing a daily diary shortly after she died. Each page in the octavo is preprinted with a date. In 1867 Wyman restricted himself to writing his daily observations on the corresponding page. However, there were times in 1867 when the gravity of his observations forced him to write in small letters, leaving a space between the text and the printed line. He would then flip the journal over and write between his previous text and the line. In later years, he reused empty pages in the earlier journals, crossing out the printed date and writing at length (see figures below for examples of each strategy). Wyman likely carried his field notes with him each season; he annotated and indexed entries for clarity, and wrote drafts of the 1875 monograph in them. In order to reconstruct where Wyman camped and excavated, I georeferenced an 1868 map of Florida which contained railroads and principal towns across northern Florida. I also georeferenced late 19th-century U.S. Coastal Survey maps of the St. Johns channel which contained place names for towns, hotels, and undeveloped landings. Many site locations were already known; Wyman’s monograph was the basis for the initial Florida master site files. Some of Wyman’s sites remain to be located, and a few sites had to be reduced to localities that may contain multiple places. Wyman followed a typical migration route from Massachusetts to the St. Johns region. This travel pattern was taken by many northerners heading south, and may have been suggested to Wyman by Daniel Brinton (Murowchick 1990). Brinton had already argued that marine shell sites on the Atlantic coast were anthropogenic. In contrast, he believed that freshwater shell sites on the St. Johns River were geological deposits reused as burial places (Brinton 1867). After taking a train to New York City, Wyman would board a passenger ship and head to Fernandina in northern Florida. He would secure passage to Jacksonville at the mouth of the St. Johns River, and then travel via steamship to Hibernia or Palatka on the St. Johns (Fig. 1). It was often there that he would meet up with G.A. Peabody and G. H. Dunscomb (Wyman 1875: 3). The cadre would travel with a local guide, via row boat and small sail boat, up and down the river. They rarely boarded in hotels; they mostly camped on top of shell sites. Peabody and Wyman had a symbiotic relationship. Wyman would excavate or explore during the day, while Peabody typically hunted for food or biological specimens. Peabody would also conduct reconnaissance, either by looking for undiscovered sites, locating sites that had been mentioned to them by locals, or by scanning cut banks for objects. Wyman restricted his travels mostly to the main channel, with rare side trips along spring-fed tributaries such as Alexander Springs run and the Wekiva River (Fig. 1). I was able to locate 58 shell sites and burial mounds mentioned in his journals (Table 1). Wyman’s sites are clustered in the central portion of the St. Johns River (Fig. 1). The lack of freshwater sites north of Forrester’s Point (near modern day Palatka) is not a product of Wyman’s survey strategies. Also illustrated in Figure 1 are all the sites currently known to have freshwater shell. The portion north of Forrester’s Point is largely devoid of sites, on account of the brackish water conditions. Wyman identified many of the larger sites along the main channel, but these places were only a small sample of the total known today (see also Moore 1892). A more nuanced understanding of Wyman’s research can be garnered from a consideration of his annual trips. Wyman’s most geographically extensive excursion was conducted in 1867. Not only did he travel the furthest south (Salt Lake), but the 20 visited sites were the second most of any year. This year he also traveled to the most number of camps, 19 in total, and did not reside in any one camp for more than 11 days. He produced stratigraphic sketches at seven sites, in addition to one plan map. Wyman first made his way down to Enterprise, where he stayed for eight days while stocking up. He boarded for a few nights at the Brock House hotel, which was situated next to the Old Enterprise shell mound, and also camped nearby. Once provisioned, he ascended the St. Johns, and then returned northward describing sites and making excavations along the way. A number of Wyman’s strategies were either established or already in place at the start of this trip. Most of his excavations targeted exposed cut banks, as illustrated in his first substantive investigation of the season at the Old Enterprise mound. Wyman described Old Enterprise as a 6 m high, multi-ridged mound. The site had a water-side cut bank that measured 4.5 m high and 40 m long (depicted in the frontispiece to his monograph). On February 5, he recorded finding animal bones and pottery in the mound. He illustrated the profile and indicated that he dug into the exposure at a point 2 meters below the mound surface and 2 m above the scree slope at the base. He wrote: ‘Took great pain to dig into undisturbed portion, there is no evidence that they [the pottery and bones] were buried.’ He would use this term ‘buried’ elsewhere in contexts that suggest he was looking for evidence of intrusions from the surface. He continued the next day, noting that he found pottery ‘from 3 to 10 feet’ in his profile excavation. At this point in time, Wyman’s primary criteria for determining whether a site was anthropogenic or not was the appearance of pottery or other objects within the mound strata. He would continue to exploit cut banks throughout his excursions. A pleasant day, & less hot than the two preceding ones. Made an excavation on a small shell mound. Found the skeleton of a child & a few fragments of adult bones, but they were soon exhausted. The PM to dig in the large shell mound near Summerlins house. This mound is of great size & composed of an immense number of shells. Chiefly mixed with a few Ampullarias2 & Paludinas3. Excavated to the depth of five feet & found an abundance of pottery, charcoal, bones of deer, birds, turtles, cat fish, gar, alligator. The charcoal was formed in definite layers, & some of the bones of the deer were actually burned & charred. Some of the pieces of the pots contained a black substance as if of burned food. The evidence that the shell mounds, were made by the Indians now becomes almost inevitable. Peabody & Dunscombe hunted turkey & brought in a large male turkey. Washington left me while digging. In a test pit Wyman identified stratified charcoal deposits. Coupled with the presence of pottery, he could infer that mounds with similar stratification were likely anthropogenic. Wyman’s excavation methods at the smaller mound are unknown, but the larger one apparently had exposures. He does not, at this particular moment in his survey, appear to have excavated stratigraphically. Instead, Wyman interprets the stratigraphy and its contents after the fact. Yet he also allowed that the stratigraphy itself, in particular charcoal and evidence for burning, could also indicate an artificial source of the deposits. The narrative provides a sense of Wyman’s typical work day. In this case, Washington was Wyman’s guide, and it seems that here, as for many of his expeditions, Wyman worked alone or aided by one or two others. Once Wyman determined that at least some shell mounds were anthropogenic, he still had the issue of time. In this regard, an important event occurred on March 16, when Wyman began flipping his journal over to write more. He had encountered a 100 m long, 5 m high intact shell mound (Live Oak mound). On top of the mound was a large oak tree. Adhering to the base of the dead tree’s upturned root mat were bones and pottery. A 1-m-deep pit that he excavated below the tree yielded animal bones. He wrote that ‘this throws back the most superficial part of the mound several hundred years.’ The implication for Wyman was that the surfaces of the mound were likely deposited in great antiquity given the presumed age of the tree. He would use this logic elsewhere to determine the relative age of deposits. He routinely measured the width of trees to gauge their age in later seasons. Live Oak shell mound is, in fact, one of the earliest mounds in the valley, dated to as early as 7,400 years ago (Sassaman & Randall 2012). A final point regards his excavation and recognition of stratigraphy. Wyman’s description and illustration of his excavations into a cut bank at Old Town provides a further sense for his practices (Fig. 2). Wyman ‘Dug a large pit near the tent & sunk it until water was reached.’ His sketch suggests that he dug down near a vertical cut, no doubt to provide a clean profile, but also to document the basal stratum. That he may have also recorded the objects that he found while excavating is suggested by the descriptions of the strata, whose thickness he also measured (see Fig. 2 caption). He delineated each stratum on the basis shell species, non-shell inclusions, and the presence of pottery. Wyman’s journal entry for March 20, 1867. This entry includes an illustration and description of stratigraphy encountered in an excavation at the Old Town shell mound. Wyman described five strata, with depth in inches, as follows: ‘(1) Loam & shells & pottery, 6 in; (2) Paludinas without sand, & with pottery, 8 in; (3) Mussels decomposed, 6 in; (4) Paludinas & sand, 18 in; (5) Paludinas & water but no sand, 18 in.’ The lower portion of the journal page has writing that is also upside down (see text). Used with permission of the Harvard Medical Library in the Francis A. Countway Library of Medicine. To summarize 1867’s excursion, Wyman established his pattern of site discovery, excavation, and description. He became interested in the sites themselves, and not simply the objects within them. He determined that the mounds were, beneath the surface, anthropogenic. Some sites also had basal deposits that lacked pottery. Finally, he used at least two excavation methods: cleaning and cutting into exposed profiles, and test pit excavation. There is no evidence that he screened the excavated matrices. 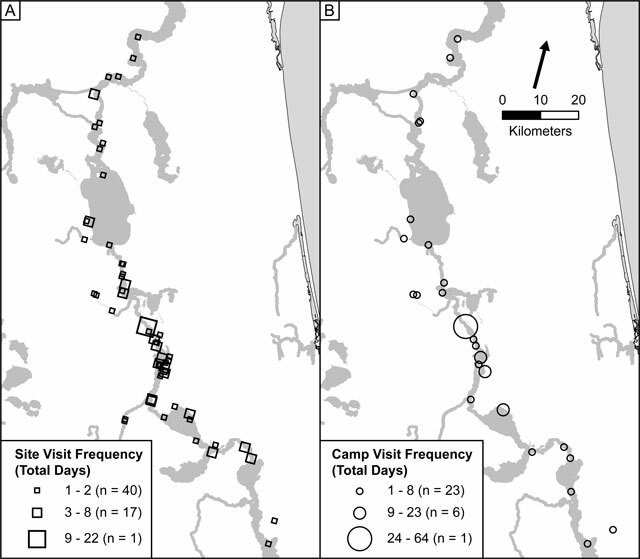 Wyman’s 1871 excursion targeted the middle valley, which is reflected in the lower number of camps (n = 13) and longer duration of camp visits. However, his site count (n = 18) was only slightly lower than before. He switched from a regionally extensive strategy to a more intensive survey near his campsites. He focused on making more precise measurements of mound stratigraphy, recording the width of live oak trees to determine when the sites stopped receiving shell, and describing the morphology and arrangement of shell sites. He recorded multiple profiles at Horse Landing, Old Town, and Osceola Mound. Wyman was particularly interested in Horse Landing; the 115-m-long mound had been bisected by the river. Several of the Horse Landing illustrations depict the complex stratification of the site across much of its length, and highlight the distribution of burned surfaces and sand lenses throughout the deposits. During the 1867 expedition, Peabody found a chipped stone tool in sand below the shell, indicating that the entire Horse Landing mound was anthropogenic. Otherwise, pottery was extremely rare. Two sketches provide insight into his strategies this season. 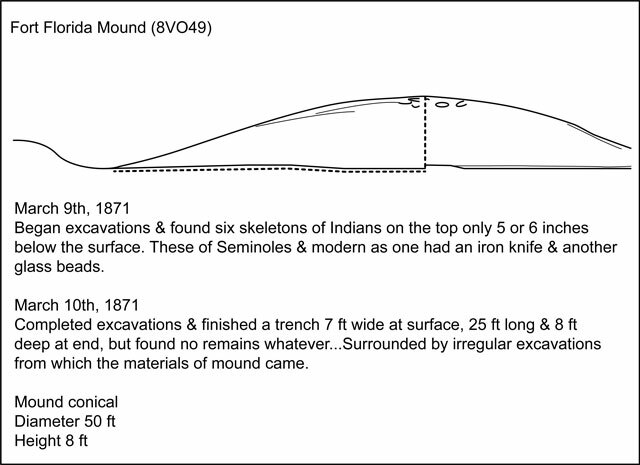 At the Fort Florida complex, Wyman diagrammed his trench excavation method (Fig. 3). On March 9, he began digging into the small sand mound and encountered six skeletons near the apex. Based on the inclusions of an iron knife and glass beads he correctly reasoned these particular burials were post-contact in age, but he was unsure if the mound was constructed for burial earlier. He trenched the mound from edge to apex, and dug below the surrounding ground surface. The trench measured ‘7 ft wide at surface, 25 ft long, & 8 ft deep at the end’ (Fig. 3). The outline of the trench is dashed in Figure 3. He failed to find any more bones or objects. Wyman arguably used trenching for two purposes. One was to determine the nature of the mound matrix and search out objects. However, his depiction of a straight wall at the center of the mound indicates he was likely interested in observing the stratigraphy of the mound. There is, however, no evidence he ever sketched stratigraphy in a trench of this style. 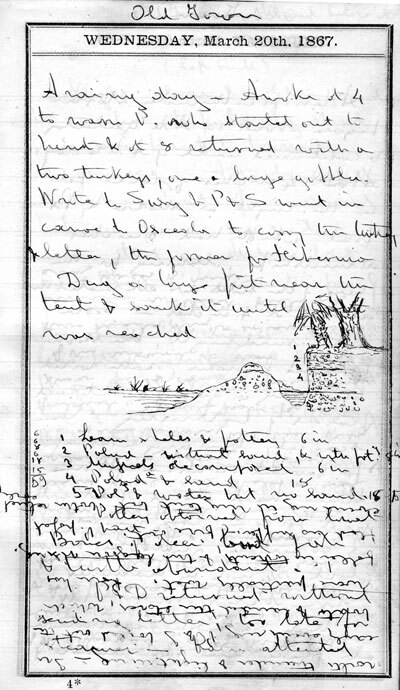 Wyman’s journal entries for March 9 and 10, 1871. The sketch depicts Wyman’s excavation of a trench into the Fort Florida burial mound. The arcs and circles at the apex of the mound likely represent burials. Redrawn and transcribed for clarity. Wyman also described his method for performing a ‘general survey’ of the Old Town mound on February 17 (Fig. 4). The plan map depicts the shell mound as a ‘crescentic’ ridge, a form typical of many shell mounds in the region. Wyman illustrated vegetation types around the mound, in addition to the morphology of the main river channel and nearby lagoon. A compass diagram illustrates the orientation of the mound. He measured the mound’s length ‘on the crest by pacing.’ Based on the diagram, he measured the width in a similar fashion. Wyman likely used this general survey technique at most locations. Modern topographic survey of intact shell mounds indicates that his pacing often resulted in a slight overestimation of mound size, likely because he didn’t measure on the horizontal axis (Randall 2014). Wyman’s journal entry for February 17, 1871. 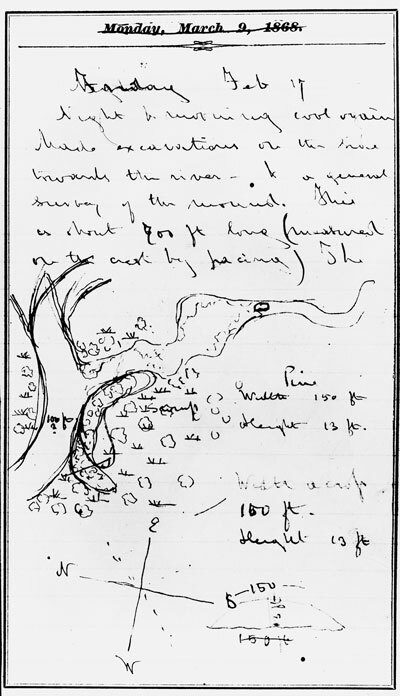 The sketch depicts a plan view of the Old Town shell mound, and describes his method of ‘general survey.’ Used with permission of the Harvard Medical Library in the Francis A. Countway Library of Medicine. Wyman’s 1872 trip continued the same intensive strategy as the previous year. He visited at least 21 sites, but camped at only 10 places. Wyman also turned his attention to the topography and stratigraphy of the largest shell sites. He produced a plan map of the Mouth of Silver Glen Springs Run site, a U-shaped mound that measured at least 300 m long on a side. Vignettes also demonstrate how his lack of labor, combined with poor health, can help explain why he did not make certain observations. For example, on March 24, Wyman described excavations into one of two 5-m-high conical mounds at the Hontoon Island North site. In his monograph he states that ‘Both were probably burial mounds, but from inability to procure the necessary labor we did not fully explore them’ (1875: 28). While true, in his journal he wrote ‘dug to a depth of five feet without finding anything except pieces of pottery and a few fragments of some whole human bones, and at 10 o’clock gave up further search as it was very hot and the work laborious.’ Thus, his failure to note stratigraphy in the mound was due to his health and the lack of labor, and not inherent to the site itself (see Moore 1892). C.B. Moore would later ply the waters of the St. Johns with a large enough labor force to excavate such mounds in their entirety. When not excavating, Wyman was asking synthetic questions regarding chronology, taphonomy, and the significance of different kinds of shell sites. He developed a shell mound chronology based on differences in matrix and object types (Fig. 5). The youngest contained pottery and other items in association with loose shells. The older consisted of consolidated shell without pottery. A third type contained pottery with unconsolidated shells on top, which were underlain by consolidated shells and no pottery. Wyman reasoned that the different deposits reflect ‘successive occupation of the shores of the river by different populations, or by one and the same population through successive generations changing their mode of life. In either case, it is quite clear some of the mounds were for a time abandoned & then reoccupied.’ Wyman was correct, although not in the way he imagined. Many shell mounds have consolidated bases, and these tend to date to the Archaic period. Additionally, there are unconsolidated shell mounds of similar antiquity. Consolidated shell (or concreted shell as well call it today) is a product of water interacting with calcium carbonates in the shell, and can occur in mounds of any age. However, we now know that many of these Archaic mounds were abandoned for millennia, only to be used as the platforms for burial mounds during the St. Johns period (Sassaman & Randall 2012). Wyman’s journal entry for dates between March 24 and 30, 1872. The sketch depicts Wyman’s schematic model of different shell site deposits through time: (I) loose shells with pottery (recent); (2) consolidated shells without pottery (old); (3) consolidated shell without pottery beneath loose shells with pottery. Used with permission of the Harvard Medical Library in the Francis A. Countway Library of Medicine. Wyman concentrated his efforts on 10 sites, and visited only eight camps in 1873. In addition to revisiting sites around Old Town and Hontoon Island, he took an extended trip up the Alexander Springs run. In general, the 1873 journal entries contain significantly fewer details than before. There are no plan maps or stratigraphic sketches. The entries are shorter, and many days are missing. The only explanation I can offer is that Wyman frequently described feeling ill. Not only did his lungs trouble him, but he was experiencing excruciating headaches. Wyman arrived in the St. Johns basin in 1867 equipped with a suite of techniques for investigating shell sites. These were refined through time, and deployed as circumstances warranted. Looking at his collective efforts, a clearer picture of his research program emerges. As regards his testing strategy, Wyman did not give equal time to all portions of the river valley (Fig. 6, Table 1). Indeed, the Old Town site sticks out. Wyman excavated at the site on 22 days in total, and camped there for 64 days over four seasons. There was good reason for repeat visits to Old Town. Not only was it an ideal campsite, but it contained a lengthy cut bank as depicted in Figure 2. Old Town was situated 5 km below Hawkinsville, where mail could be posted and stores purchased. Using Old Town as his base of operations, Wyman visited no fewer than 13 sites, traveling a maximum one-way distance of 24 km. For sites that he visited and then returned to camp during the day, the range was up to 6 km in any direction. One of the sites he frequented was Osceola Mound, which was also his favorite site to draw stratigraphic profiles. Indeed, the only stratigraphic rendering in his monograph is from this site (Wyman 1875: 33). Like Horse Landing, the mound had been truncated by river action, and thus there was an extensive profile to explore (Wyman 1875: 32). Wyman was also intrigued by the presence of human skeletons in the consolidated ‘sand and mud.’ Trained as a comparative anatomist, it is no wonder that Wyman would gravitate to the study of ancient human remains. But he was likely to have been interested because Morlot (1861: 301) explicitly noted that Danish kjökkenmödding ‘have never presented any human bones.’ Based on disposition of the human bones, which he argued were fragmented in a way similar to other animals remains in the mounds, Wyman concluded they were evidence of cannibalism. Wyman and Peabody made many repeat visits to identify pottery or objects in the lower levels (they did not), and to determine if the human skeleton was in a pit emanating for the surface (it was not in a pit). Regardless, Wyman’s choice of campsites was pragmatic and research-oriented in its logic. Map of Wyman’s camps and the sites he visited, showing the total absolute frequency of visits per feature during 1867 and 1871–1873. Note: the total for site visits includes those places for which a precise date could not be determined. In these few instances, the count was treated as one visit. Wyman accepted that stratification could be the result of human action, and that the lowest levels were likely the earliest, all things being equal. His initial interest was to determine if the mounds were anthropogenic, and to accomplish this task he reasoned that the best evidence would be objects of human agency, or human remains, found within the mounds. As his first excavation at Old Enterprise indicates, he was also aware that one could determine if a site had been disturbed by examining stratigraphic cross sections. He would expand his criteria to include evidence for burning. Wyman employed a variety of excavation techniques, depending on the disposition of the site. At cut banks or escarpments he would typically sink a trench into the mound face. That he excavated these trenches stratigraphically is suggested by his ability to delimit which layers had pottery. Each of his excavations were limited in scope; he does not appear to have successively excavated back into the mound as would be conducted later by Putnam. Instead, Wyman would move to another location if he did not find definitive evidence for human agency. On at least one occasion Wyman conducted trench excavations into the side of a sand mound. It should be noted that these two techniques, vertical slicing and trenching, were coupled with level excavations by Putnam in what became known as the Peabody Museum method. As documented by Browman (2002a), it was the Peabody method which was translated into the Chicago Method. Wyman also conducted the equivalent of ‘shovel test pit’ reconnaissance. Often these small pits were in areas already disturbed by tree tip-ups. A final method, and likely the one that Wyman and Peabody used everywhere, was to examine exposed profiles for signs of stratification or objects. For example, he was unsure of whether the Horse Landing mound was anthropogenic until Peabody retrieved a chipped stone tool from the sand layer beneath the basal shell deposit. In these excavations his interpretations appear to be post facto. Regardless, the evidence suggests that Wyman did excavate stratigraphically. Whatever stratigraphic association objects may have had in the field were lost via Wyman’s recording methods, however. None of his catalog entries in the Peabody Museum’s original ledger contain stratigraphic information; he recorded site-level provenience only (and occasionally the horizontal location within-site). To return to my initial question, how did a natural scientist trained in comparative anatomy, and who became one of the first institutionally supported prehistoric archaeologists in North America, conduct his survey and excavations? As with any good story, this one is complicated. Wyman was not the first person to work on shell sites (in Florida or elsewhere), and he was deeply influenced by the insights of the Danish school, scholars like George Lyell, and his own students. His choice of working in Florida was a confluence of accidents, including his lung ailment and a chance encounter with an old friend. His excavation methods involved testing exposed mound profiles, judgmental pit digging, and trenching. At least the first two methods were not likely to have been unique to him. However, Wyman did not blindly impose a model of prehistory on the St. John. Instead, his understanding of the archaeology of the St. Johns was iterative. Wyman’s final perspective emerged from his experiences encountering the landscape of the St. Johns, coupled with his ‘wide experience, care, cautiousness, self-restraint in dealing with problems over which so many have gone astray [i.e. speculating antiquarians]… together with his ingenuity, good judgment, exact and philosophic cast of mind’ (Packard 1878: 110). He deployed particular methods as warranted by his questions and the disposition of the deposits. He was able to ask synthetic questions because he had observed so many locations throughout the region. By focusing on whether objects were encountered in shell deposits, where they occurred vertically in the site, and by detailing their broader geographic disposition, Wyman wrenched the ancient St. Johns from speculation (mostly) and produced a book that was modern in its structure, contents, and research orientation. As a post-script, I would note that the kind of enthusiasm that Wyman showed for shell sites waned in the years after his death for a variety of reasons: the pressing concern of the earthen mound phenomenon and implied incidental nature of shell sites, a lack of interest in change through time, as well as any number of historical accidents (Bourque 2002; Lyman & O’Brien 1999; Trigger 1986). However, his insights and perhaps methods were continued on through his students, while his journals and publications provide a resource to reanimate the ancient past of Florida today. 1Quotations from Wyman’s journals are rendered exactly as he wrote them. My clarifications are contained in brackets. 2Ampullaria is the archaic genus for Pomacea paludosa, the Florida apple snail. 3Paludinas is the archaic genus for Viviparus georgianus, the banded mystery snail. By volume, shell mounds are typically dominated by the mystery snail. Funding for this research was generously provided by the American Philosophical Society through a Franklin Grant. I am especially indebted to Jack Eckert at the Harvard University Library Francis A. Countway Library of Medicine for providing access to Wyman’s journals, and to Diana Loren and Susan Haskell at the Harvard Peabody Museum for facilitating access to Wyman’s collections. Many thanks are owed to Neha Gupta and Bernard Means for organizing the SAA symposium that was the springboard for this article, and for carrying the symposium proceedings through to publication. Finally, I am deeply indebted to Ken Sassaman for introducing me to the archaeology of the St. Johns, and providing new excursions in Wyman’s shadow. Bourque, B J (2002). Maine shell midden archaeology (1860–1910) and the influence of Adolphe von Morlot In: Browman, D L and Williams, S eds. New perspectives on the origins of Americanist archaeology. Tuscaloosa: University of Alabama Press, pp. 148–163. Brinton, D G (1867). Artificial shell deposits of the United States In: Annual report of the Smithsonian Institution for 1866. Washington: Government Printing Office, pp. 356–358. Brinton, D G (1869). A guidebook of Florida and the South, for tourists, invalids and emigrants, with a map of the St. John River. Philadelphia: George Maclean. Browman, D L (2002a). Origins of stratigraphic excavations in North America: the Peabody Museum method and the Chicago method In: Browman, D L and Williams, S eds. New perspectives on the origins of Americanist archaeology. Tuscaloosa: University of Alabama, pp. 242–264. Browman, D L (2002b). Frederic Ward Putnam: contributions to the development of archaeological institutions and encouragement of women practitioners In: Browman, D L and Williams, S eds. New perspectives on the origins of Americanist archaeology. Tuscaloosa: University of Alabama Press, pp. 209–241. Christenson, A L (1985). The identification and study of Indian shell middens in Eastern North America: 1643–1861. North American Archaeologist 6(3): 227–243. Eck, C (2000). A picturesque settlement: the diary notes of Dr. Jeffries Wyman’s visit to Miami and the first archaeological excavations in south Florida, 1869. The Florida Anthropologist 58: 286–293. Gifford, G E Jr. ed. (1978). Dear Jeffie: Being the Letters from Jeffries Wyman, first director of the Peabody Museum, to his son, Jeffries Wyman, Jr.. Cambridge: Peabody Museum Press. Goggin, J M (1952). Space and time perspective in northern St. Johns archeology, Florida. New Haven: Yale University Press. Lyman, R L and O’Brien, M J (1999). Americanist stratigraphic excavation and the measurement of culture change. Journal of Archaeological Method and Theory 6: 55–108. Moore, C B (1892). Certain shell heaps of the St. John’s River, Florida, hitherto unexplored. The American Naturalist 26: 912–922. Morlot, A (1861). General views on archaeology In: Annual report of the board of regents of the Smithsonian Institution for 1860. Washington: George W. Bowman, pp. 284–343. Murowchick, R E (1990). A curious sort of Yankee: personal and professional notes on Jeffries Wyman (1814–1874). Southeastern Archaeology 9: 55–66. Packard, A S Jr. (1878). Memoir of Jeffries Wyman, 1814–1874. National Academy of Sciences, Biographical Memoirs 2(4): 74–126. Randall, A R (2011). Remapping Archaic Social Histories along the St. Johns River in Florida In: Sassaman, K E and Holly, D H Jr. eds. Hunter-gatherer archaeology as historical process. Tuscon: University of Arizona Press, pp. 120–142. Randall, A R (2013). The chronology and history of Mount Taylor period (ca. 7400–4600 cal B.P.) shell sites on the middle St. Johns River, Florida. Southeastern Archaeology 39: 193–217. Randall, A R (2014). LiDAR-aided reconnaissance and reconstruction of lost landscapes: an example of freshwater shell mounds (ca. 7500–500 cal BP) in northeast Florida. Journal of Field Archaeology 39: 162–179. Sassaman, K E and Randall, A R (2012). Shell mounds of the middle St. Johns basin, northeast Florida In: Burger, R L and Rosenswig, R M eds. Early new world monumentality. Gainesville: University Press of Florida, pp. 53–72. Stoltman, J B (2004). History of Archaeological Research In: Fogelson, R D ed. Handbook of North American Indians, Volume 14: Southeast. Washington: Smithsonian Institution, pp. 14–30. Trigger, B G (1986). Introduction In: Trigger, B G ed. Native shell mounds of North America. New York: Garland Publishing, pp. xi–xxiv. Wheeler, R J, Newman, C L and McGee, R M (2000). A new look at the Mount Taylor and Bluffton sites, Volusia county, with an outline of the Mount Taylor culture. The Florida Anthropologist 53(2–3): 133–157. Wyman, J (1868). An account of some kjoekkenmoeddings, or shell-heaps, in Maine and Massachusetts. The American Naturalist 1: 567–584. Wyman, J (1875). Fresh-water shell mounds of the St. John’s River, Florida. Salem: Peabody Academy of Science.